It’s one of those days… when I REALLY don’t feel like cooking…or even chopping veggies for a salad ! But, hey, we need to eat something, right? So I made a quick, simple dinner, based on my family’s Romanian cuisine MAMALIGA! I come from a Jewish Romanian family. Romanian cuisine uses simple, cheap ingredients . One of those is Cornmeal, which we also know from Mexican and Italian cuisine. One of the main dishes in Romania is called MAMALIGA. It is actually very similar to the Italian Polenta and is some kind of a porridge made of boiled water and cornmeal cooked together. Romanians eat it with almost anything: Meat dishes, Fried eggs, Cooked vegetables and…cheese. This time, I sauteed onions in olive oil and a tsp of chopped Rosemary, and then added chopped mushrooms and sauteed for several minutes till they released most of their liquids. 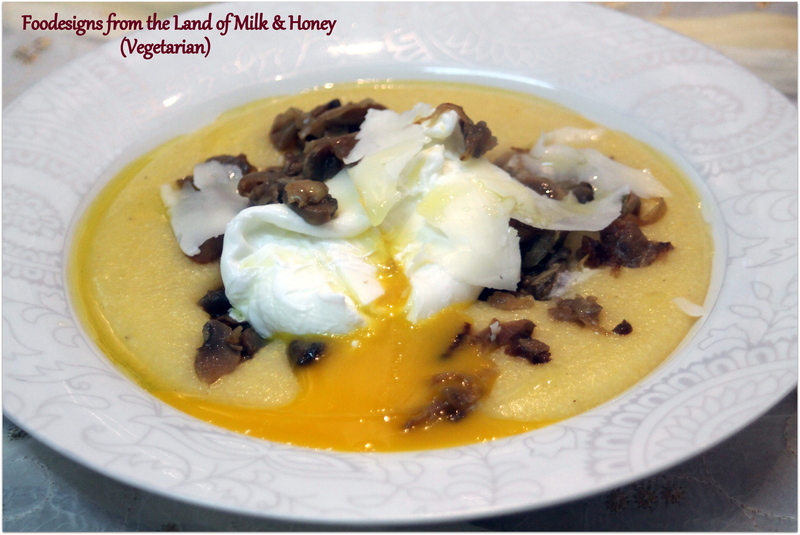 I poured the Mamaliga/polenta to serving bowls, topped with the sauteed onions and mushrooms, made poached eggs (water with a bit of vinegar) and grated hard goat’s cheese on top. Simple and delicious ! Boil the water in a deep saucepan. Add the salt, black pepper and freshly ground nutmeg. 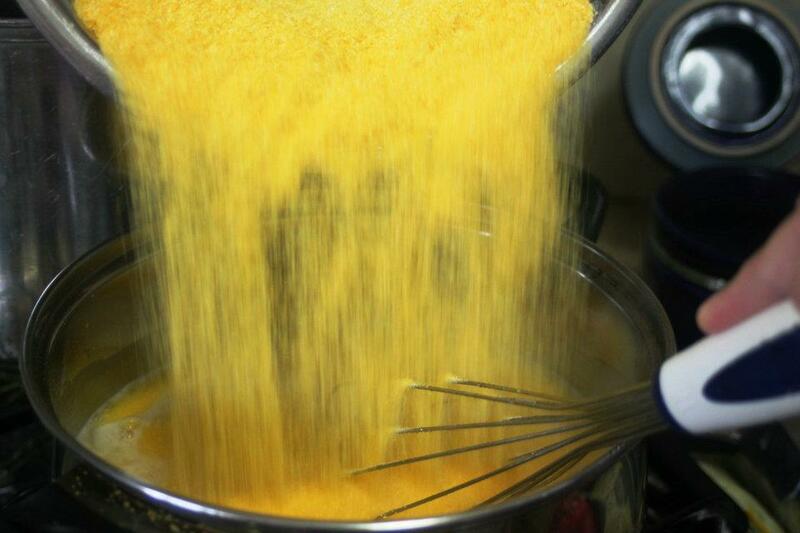 Add the cornmeal gradually!!! 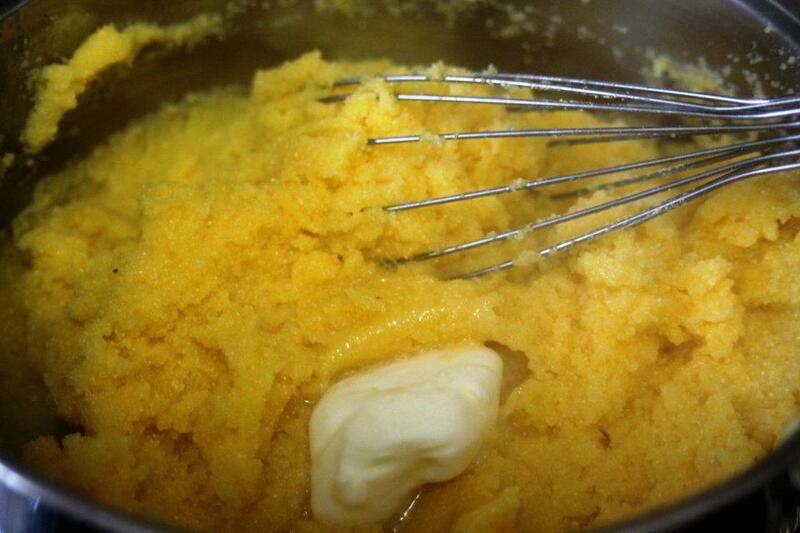 stirring with a wooden spoon or a whisk till the mixture thickens. Continue stirring with a wooden spoon or a manual whisk on LOW HEAT for about 25 minutes. Add butter or olive oil and stir. At this point – pour the thick mixture into a serving Pyrex dish and now you can cover it with all the cheeses you love. I usually put sour cream first (in Israel we have 9% fat sour cream) but you can replace it with Yogurt or cottage cheese, then grated Fetta (or 5% fat Bulgarian salty cheese, which we have over here), and finish with grated Parmesan or Peccorino or Goats’ Kashkaval. Place this in the oven for several minutes on medium temperature till the cheese melts and serve. This entry was posted in Gluten Free, Traditional Romanian Dishes and tagged cornmeal, Gluten-Free, mamaliga, polenta, Romanian cuisine. Bookmark the permalink. Oh, I only dream about delicious food! 🙂 That recipe really is so layered, flavorful and visually appealing- and with a rich history, too. This could be a nice alternative to the grilled cheese that my children always want. Corn, melted cheese…. sounds great so far!